[PDF] Advances in Artificial Intelligence: 14th Conference of the Spanish Association for Artificial Intelligence, CAEPIA 2011, La Laguna, Spain, November ... / Lecture Notes in Artificial Intelligence) | Free eBooks Download - EBOOKEE! Posted on 2018-01-16, by luongquocchinh. 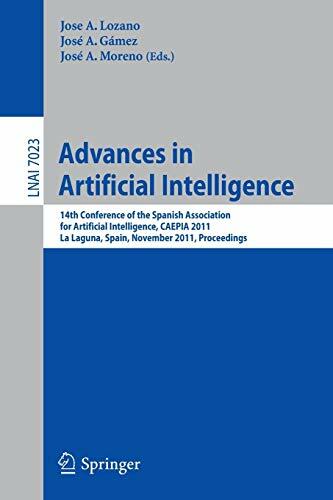 Description: Product Description: This book constitutes the refereed proceedings of the 14th Conference of the Spanish Association for Artificial Intelligence, CAEPIA 2009, held in La Laguna, Canary Islands, Spain, in November 2011. The 50 revised full papers presented were carefully selected from 149 submissions. The papers are organized in topical sections on agent-based and multi-agent systems; machine learning; knowledge representation, logic, search and planning; multidisciplinary topics and applications; vision and robotics; soft computing; Web intelligence and information retrieval. No comments for "[PDF] Advances in Artificial Intelligence: 14th Conference of the Spanish Association for Artificial Intelligence, CAEPIA 2011, La Laguna, Spain, November ... / Lecture Notes in Artificial Intelligence)".